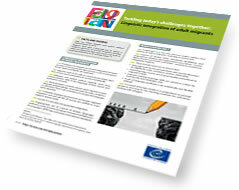 Europe offers a rich diversity of work-related language learning for adult migrants and ethnic minorities. The Language for Work (LfW) Network enables professionals working in this field to benefit from that diversity. 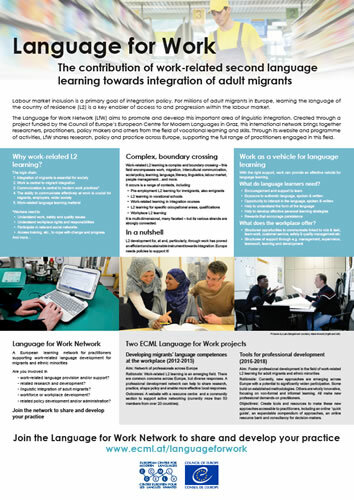 Raise awareness and promote work‐related language learning for adult migrants and ethnic minorities at national and European levels. Would you like to translate the guide into your language? If so, please let us know via the contact form. The project 'Language for work - Tools for professional development' will further develop this resource through the ECML’s programme 2016-2019. 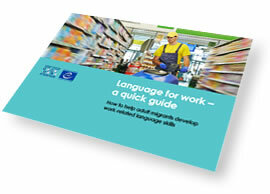 These pages result from a project run within the ECML's Learning through languages programme entitled "A European learning network for professionals supporting work related second language development" (Language for work). Video presenting the publication on the occasion of the ECML conference in December 2016. The presentation took place in the context of a workshop involving two related ECML project results/publications (ICT-REV and More Dots).